As I mentioned in the last post, I dragged my family to Kentville on Saturday to an open house at Gaspereau Press for their annual Wayzgoose. They also had other activities throughout the weekend like printing demonstrations, presentations, bookbinding workshops etc. I only made it to the open house. This is the first year that I have attended and they have been doing it for 11 years; maybe next year I'll get down to more of the events. One thing I hadn't seen before, was this handy machinery that cast lead type in an instant. This is Andrew Steeves making a lead cast of my son's name - the whole process took only a minute and the lead was cool enough to hold when it came sliding out the front. I also came away with a bundle of posters that were printed during the open house. 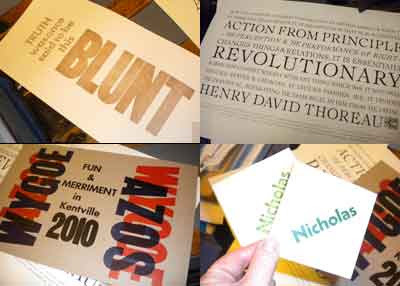 Shown here top left, the BlUNT poster letterpress printed on a Vandercook proof press, then top right, a sample of some offset printing for the quotation from Henry David Thoreau. Bottom left, is the letterpress poster that Nicholas and Amos printed on another Vandercook proof press, and bottom right, a couple little cards printed on a parlor press using the lead cast that Andrew made a few minutes previously. They also have an offcut paper sale, where you can buy offcuts of nice paper, and it's cheap. So of course, I brought home some paper too - bonus. The machine that cast the young boys name brings back many memories. The machine is a Ludlow Type Caster, we used to run a bindery and also a letterpress printing facility, we had a Ludlow for many years. 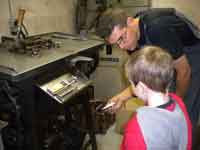 Great fun for people to see this old machine working. I run a bookbinding website where you can see more of the Ludlow in action, drop by anytime. ah, a Ludlow Type Caster! thank you, Richard. At the time, he told me what it was called but I couldn't remember.